We are delighted to offer this exciting opportunity for you to own shares in four Axom horses. We had a quantity of shares remaining for sale in four horses and decided to withdraw all of these remaining shares from individual sale, grouping them together as one lot, offering the group of four in 5% units. The result is that they all become more affordable, but the group have to be purchased as a whole. There are only 20 shares available in the 4-horse syndicate, on a strict first-come, first-served, basis. 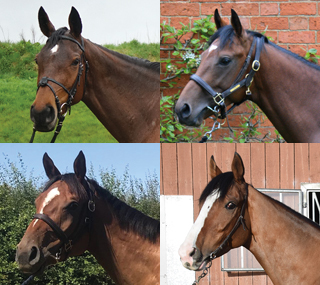 We will do our best to secure you an owner's badge whenever one of your horses runs. On the occasions this isn't possible, you will receive free racecourse entry. As an owner, you'll receive regular updates, receive reclaimed VAT, be able to attend stable visits and hospitality events, plus enjoy other benefits associated with racehorse ownership with Axom. Each Member of the 4-horse syndicate will own 1.75% of Deja Vue. This syndicate term lasts until 31/05/2020. This four-year-old filly is in training with Anthony Honeyball in Somerset. By the popular sire, Fame And Glory, Deja Vue won her only point-to-point in Ireland in March 2018 and was purchased for £82,000 at the Tattersalls Cheltenham Sale the following month. She is a half-sister to the useful four-time winner Jetstream Jack and from the family of Mendip Express, who won at Cheltenham and finished second over the Grand National fences at Aintree. Deja Vue returned home with a foot infection in her only race in Axom colours so far, following a tough winter for her stable, which was hot by a virus before Christmas. She is seen as a genuine chasing prospect, but can win over hurdles before tackling the larger obstacles. FALCO BLITZ - trained by Nicky Henderson in Lambourn, Berks. Each Member of the 4-horse syndicate will own 1.5% of Falco Blitz. This syndicate term lasts until 31/05/2020. Falco Blitz is a good looking and athletic son of Falco in training with Champion Jumps Trainer Nicky Henderson. This four-year-old finished second on his only point-to-point start in May 2018 and, after a summer break, has done nothing but please Nicky Henderson since his arrival at Seven Barrows. Falco Blitz is by Falco, the sire of Peace And Co, who Nicky trained to win the Triumph Hurdle in 2015. Falco Blitz has chased home two decent horses in his last two runs over hurdles and has been given an opening mark of 128 over hurdles, although this smooth jumper is seen as a genuine chasing prospect for next season. ORLIKO - trained by Richard Hannon near Marlborough, Wilts. Each Member of the 4-horse syndicate will own 1% of Orliko. This syndicate term lasts until 31/10/2019. By star sire, Kodiac, Orliko is out of the prolific broodmare Lisieux Orchid, who has produced six winners from seven runners. Orliko's half-brother, Tigrilla, won a Listed race in France as a two-year-old and the family has proved to be tough and genuine. Orliko had three runs as a juvenile, improving with each start before gaining an official handicap mark of 62. Orliko is now back in training after being gelded through the winter and may step up in trip this season. NYLON SPEED - trained by Alan King near Marlborough, Wilts. Each Member of the 4-horse syndicate will own 0.5% of Nylon Speed. This syndicate term lasts until 31/05/2019. Nylon Speed, a winner in Germany as a three-year-old, landed his first start for Alan King and Axom on the all-weather at Kempton, before making an impressive hurdling debut at Warwick in September 2018. The son of Campanologist has since won two further races on the all-weather and is a really consistent dual-purpose type, who may mix hurdling and running on the Flat, depending on the ground (as he needs fast ground). Please note that Nylon Speed had a wind operation before his four wins for Axom. For clarity, each owner in the 4-horse syndicate is purchasing four separate shares in four existing Axom syndicates, as specified above. The four horses included in the offer have differing syndicate end dates and the pricing structure is based on these differing end dates. When each of the above individual syndicates reaches the end of its term, owners will have the option of renewing their share, or attempting to sell their share for the valuation provided by Axom. Owners who choose to continue after the dates specified above will have their monthly cost adjusted accordingly. The capital value for all of the horses in the 4-horse syndicate works out as £2,823.58 per 5% share. The capital risk is £282.37 per 5% share. Our reduced management fee is set at £742.03 per 5% share. The all-inclusive racing/training cost is set at £2,369.36 per 5% share. The cost for mortality insurance is £369.74 per 5% share. The Rehabilitation Contribution works out as £39.59 per 5% share. The VAT is £1,325.33 per 5% share. The total share price for this term is £7,952 per 5% share. Click here for an information pack. Shares are available for an initial payment of £2,750.00 (inc. VAT), followed by eighteen monthly payments of £289.00 (inc. VAT). Syndicate will end on 31 May 2020. VAT - Please note that under current UK tax laws, VAT is reclaimable. All VAT reclaimed from HMRC will be paid back to you in full (see Terms). We require an initial payment of £2750 to secure an interest in a share and offer a 14 day cooling-off period, in case you change your mind.